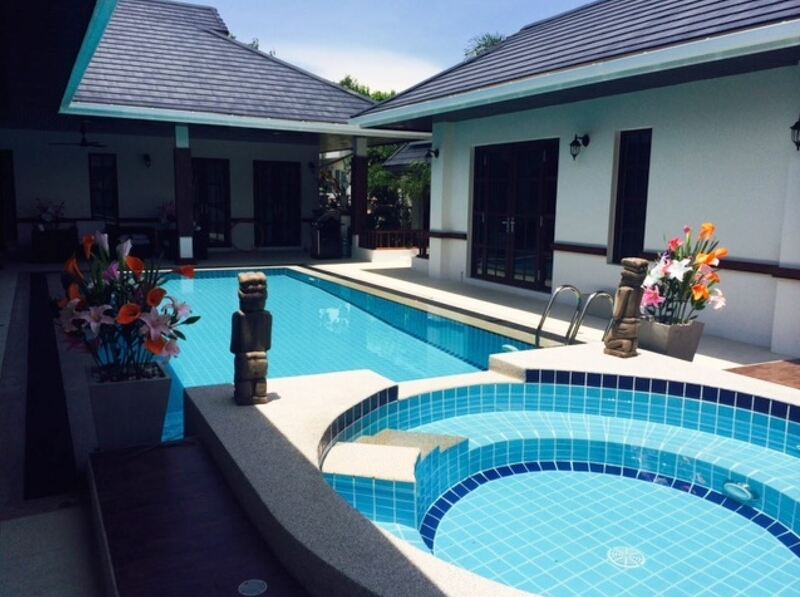 Luxury Balinese style villa at Palm Hills Golf Resort 15 minutes from Hua Hin and Cha-am. Perfect choice for long term stay or just a golf vacation. With just 15 minute drive to both cities you have easy access rich shopping, dining facilities and beautiful beaches. The villa is offered for both Sale and Rent. The villa has a spacious living/dining lounge area with a fully fitted ultra-modern European style open kitchen, 4 large bedrooms with ensuite bathrooms and a huge covered patio area around the pool and jacuzzi. You will find a separate guest house and also utility room for storage and laundry. The villa is fully furnished and decorated. This Balinese style villa is designed to provide full privacy within gated walls. It has beautiful garden areas and 2 covered car parks. A life-time family golf membership to Palm Hills Golf Course is included. This Balinese-style villa in a highly attractive area is offered at a very competitive price. Download description at: www.dansiam-property.com/3755732 and mail or call for viewing (+66(0)81-860-9611 (English/Thai) /+66(0)81-820-3496 (English/Scandinavian)).